Acensys and its team have delivered multiple data center and private cloud migrations to Fortune 500 companies and have migrated multiple-hundreds of applications. While we recognise that every customer is different and will have unique starting points and levels of operational maturity, we bring in a set of consulting capabilities along with our unique IP including artefacts ready to customise to your requirements such as RFPs, methodology, design documents, test plans, programme plans, and business cases. Acensys – we help companies assess their applications and readiness to migrate to the cloud, to select the appropriate target destinations (be it public, private or hybrid cloud) and to then drive the delivery and execution of the migrations and surrounding programme of change. 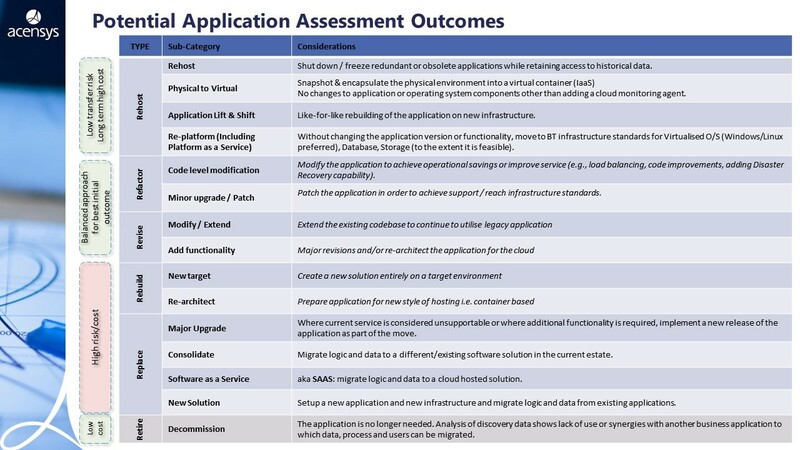 Once Assessment is Complete, a decision analysis is done to determine the costs and benefits of moving the application to the cloud. In summary, Acensys understands the entire value chain of your operation and can help you to justify the required spend to move the cloud. Budget – Small budgets generally drive to public cloud as private/hybrid cloud tend to have a high startup cost for hardware/software. Security & Compliance – High complexity compliance models generally force decisions to private cloud. However, with public providers gaining industry certifications such as ISO, PCI-DSS, Sarbanes-Oxley the decision is shifting back to cost rather than risk. SLA control – Transfer to public clouds often results in accepting an off-the-shelf SLA for a particular service. This is part of the service catalogue offered and is generally not negotiable. Organisations must decide whether to accept a different SLA regime or establish the service in a private environment. Legacy Integration – There are sometimes situations where a solution is required to integrate to legacy systems but the benefits of public cloud are required for the main system. This often results in complex network planning or establishing an integrated hybrid environment of private & public clouds to service the business need. Why set up a migration factory? Many customers have literally hundreds of applications to move. Setting up an industrialised migration factory is often the solution to industrialise the move to the cloud. If you are doing a major shift to the cloud, we can come in and help you and your suppliers set up an industrialised approach to move to the cloud. What are typical migration factory capabilities? What Risks does a migration factory mitigate? Looking for a First-Class Cloud Migration Consultancy?